UPC stands for Universal Product Code, the barcode system used for retail products in North America. The Universal Product Code was the first system of barcode labelling to be widely adopted. According to BarCode 1, the American grocery industry first established UPC as the standard barcode symbology for product marking April 3, 1973, and foreign interest in UPC led to the adoption of the EAN code format, (a format similar to UPC), in December 1976. The mass adoption of bar code technology by retailers and manufactures was a long, slow process that did not begin to go mainstream until mass merchandisers such as Kmart adopted it in the 1980's, followed by other retail and grocery chains such as Walmart. The rapid growth of large retail chains and the associated productivity gains primarily occurred in the 1990s and early 2000s (Basker et al. 2012, Foster et al. 2006). Throughout the 30-year period following the initial use of bar coding in 1974, organisations at both ends of the supply chain made investments in complementary technological, organisational, and process change. According to Fortune magazine, 80 to 90 percent of the top 500 companies in the U.S. were using bar code technology by 2004. The standard Universal Product Code version is known as UPC-A and is 12 digits long. There is also a shortened 8 digit version called UPC-E which can be used when there is not enough room for the 12 digit version. Europe uses a different barcode system called the EAN (European Article Number) which is either 8 or 13 digits long. To ensure global conformity of the EAN/UCC numbering system (and make trade between countries easier), as of January 1, 2005 the Sunrise 2005 initiative mandated that "all U.S. and Canadian companies must be capable of scanning and processing EAN-8 and EAN-13 symbols, in addition to 12 digit UPC symbols, at point of sale" (ECCC). Barcoding is an integral part of point-of-sale (POS) systems. When a barcoded product is purchased and scanned at checkout pricing and product information is automatically retrieved by the POS system. Retailers collect enormous amounts of information from POS systems on a daily basis - this is processed and used for planning and marketing purposes. But it's not just retailers who use barcodes. Barcodes are also used in manufacturing (as in the automobile industry, for instance), for data tracking and for security. For example, in some hospitals, barcoded tags are used to identify patients. Businesses that offer products for sale using a brand name/label that belongs to them and businesses that export good outside of the U.S. or Canada need to have UPC barcodes. 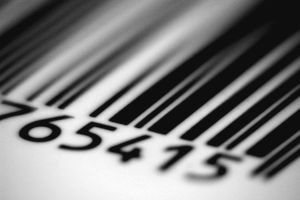 UPC bar codes are also handy for scanning and tracking your products through the supply chain. How Do I Get a UPC Code? Organizations that wish to use a UPC code must apply to GS1, which is a non-profit organization that maintains global standards for the identification of goods, and deals with bar code issuance and maintenance. Having a single organization issue UPC codes ensures that no two products can have the same UPC code. If you need a UPC, you need to apply to GS1 for membership and a company prefix. (The link will take you to the GS1 page with details about the UPC barcode application process.) A yearly fee is required to maintain a UPC Code registration with GS1. What Is the Composition of a UPC-A (12 digit) Code? The next group of 5 digits identifies the manufacturer. This number is assigned by GS1. The next 5 digits identify the particular product and are assigned by the manufacturer. The last digit is a Modulo 10 checksum. How Can I Look up UPC Code Information for a Company? You can look up UPC barcode information through the GEPIR (Global Electronic Party Information Registry), which has information for GS1 registered companies worldwide. You can search for a company by UPC number or UPC information by company name. Also Known As: Bar code. Common Misspellings: Unaversal Product Code. Examples: With Sunrise 2005 in effect, both EAN and UPC labels should scan properly worldwide.